Climate change is already happening and its effects, especially on rural communities in India, are particularly adverse. The need is to highlight the key issues and understand the practical challenges that must be addressed if India is to build the capacities of rural communities to robustly adapt to climate change and realize the National and State Action Plans on Climate Change (NAPCC and SAPCC). Since the last 4 years, WOTR has been implementing a large scale integrated project on climate change adaptation in rural Maharashtra, Andhra Pradesh and Madhya Pradesh in collaboration with NABARD, the Swiss Development Cooperation (SDC), the Indian Meteorological Department (IMD), the Central Research Institute for Dryland Agriculture (CRIDA), the World Agro-Forestry Council (ICRAF) and the State Agricultural University (MPKV). This experience has catalyzed insights, learnings and experiences from multiple stakeholders which we have formulated as Position Papers across 12 thematic areas: Watershed Development, Water , Food and Nutrition Security, Agriculture, Livestock, Bio Diversity and Eco System Services, Disaster Risk Reduction and Risk Prevention, Alternate Energy, Economics and Livelihoods, Health , Gender and Governance. These papers assess and analyse the key policy and operational challenges faced in building adaptive capacities across sectors, from the perspective of different key stakeholders; aim to contribute towards formulation of an enabling policy and operational framework that would facilitate effective implementation of the NAPCC and SAPCCs in rural India; and hope to trigger creative dialogues between key stakeholders with a view to providing effective support to efforts that seek to build the adaptive capacities and resilience of rural communities. 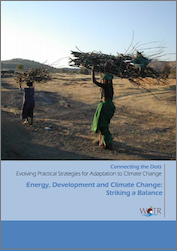 This paper, “Energy, Development and Climate Change: Striking a Balance”, examines the energy scenario availability, access, influence of markets and government policies in rural India, especially in the areas where WOTR has been working. It highlights the successful partnership between local communities, with their innate grounded wisdom and local knowledge, and modern researchers and scientists willing to position their learning and experience on community science. It roots for a positioning and policy framework that broadens the scope of work from cooking fuel and lighting, to energy needs for irrigation, for trade, business, manufacturing, infrastructure, transportation and construction. Whenever we discuss rural energy needs, we tend to limit our discourse to subsistence levels for cooking fuel and lighting; and rarely ever include energy for livelihoods, mobility or infrastructure. Moreover, even this infrequent discourse does not envision a fulfilling life of comfort, dignity and well-being. In charting out a developmental pathway which is ecologically sustainable, India has a wider spectrum of choices precisely because it is at an early stage of development. Adaptation and mitigation go hand-in-hand and cannot really be separated. As communities adapt to the degraded natural resource base and chart out a development pathway that is ecologically sustainable, the resulting scenario is what we call mitigation through adaptation. 1. Opportunities exist for enhancing energy efficiency in all sectors. 2. A focus on research & development and immediate tangible benefits are key to community acceptance product development often falls short of quality, service and user friendliness, especially in rural markets. 3. Post-project management is essential to ensure sustainability. Building capacities of communities to handle new products and motivating them towards their continued maintenance and up-gradation is very critical. Tools and methodologies to enable a bottom-up process of planning that would integrate (i) local knowledge, wisdom and good practices existing within eco-system based communities, and (ii) modern science, technology that incorporates local wisdom, are essential. Access to energy should be recognized as a universal right, to be enabled by all governments and the global community. Based on this philosophy, as well as insights from field experiences and the application of our participatory tools and methodologies, WOTR has included in its mandate the following four action areas. These action areas and a set of policy recommendations arising out of them are discussed in more detail in the full report (see link at the bottom of the page).